You may know that Superdrug recently celebrated being on our high street's for an impressive 50 years, how amazing!!! To mark the celebrations lots of makeup and beauty brands teamed up with Superdrug to bring us some special, limited edition releases... whoop, I love me some limited edition makeup! 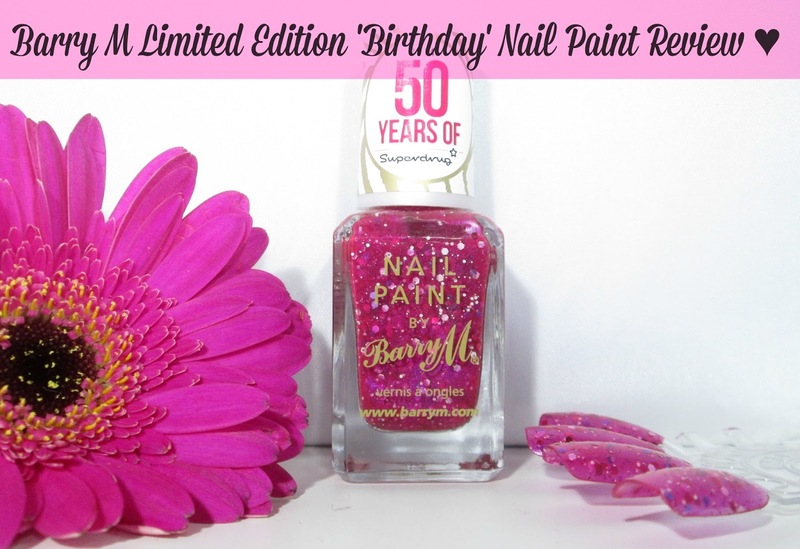 Barry M joined in with the '50 years' fun with their offering being in the shape of a gorgeous pink, glittery, sparkly nail paint called 'Birthday' and my goodness it is literally like a birthday party in a bottle, full of Superdrugs classic 'hot pink' look and pizazz he he. 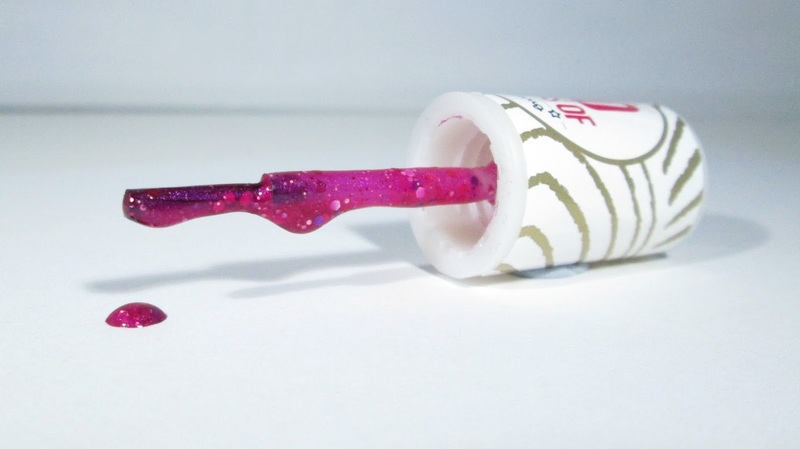 Barry M's 'Birthday' is a rather show stopping nail paint, it has a gorgeous, hot pink base and is crammed full of white, pink and purple glitters which all vary in size. 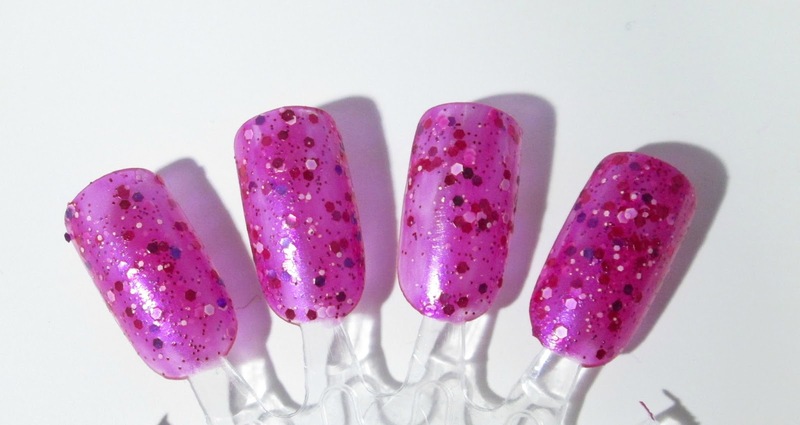 What makes 'Birthday' differ from alot of Barry M's glitter nail paint's is that it isn't your typical glitter top coat, the hot pink base is completely opaque with 2 thick coats which I think is fab and saves you the time of having to apply a base coat of another solid polish first. The formula of 'Birthday' is slightly thicker than your average Barry M nail paint but I put this down to the amount of glitter suspended within the polish, it's also really easy to apply, I didn't find myself having to dab the glitter particles on at all like I usually have to do, they just went on easily with normal brush strokes, again another bonus! The lasting power of 'Birthday' was rather good, I had the polish on my nails for 4 days without it chipping however I did have some slight wear at the very ends of my nails, so I all in all I think that's pretty good going seeing as I only applied 2 thick coats of the polish to my nails. When it came to removing the polish, I soaked a cotton pad with nail polish remover and held it over my nail for a good minute or so and wiped off pulling upwards, I did have to repeat this several times as the glitter particles are rather stubborn to remove but I find that happens to me with most glitter polishes so it wasn't out of the ordinary. Overall I'm so happy I managed to get my hands on this nail paint and it definitely lived up to my high expectations, I mean when something is limited edition I expect it to be quite fabulous and Birthday certainly is. The gorgeous 'Birthday' nail paint is available exclusively in Superdrug for £2.99. If you haven't picked this little beauty up yet, I'd urge you to do so as I'm unsure how long this particular shade will be around seeing as its just limited edition. That colour is gorgeous. I don't own many bright pinks, but I am tempted to buy that. 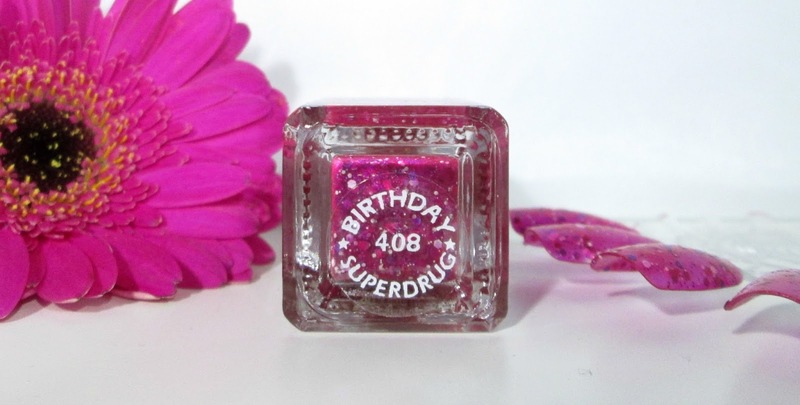 This looks really pretty, I can't believe Superdrug is 50 years old!